We were born and raised in Kharkiv. We studied in Kyiv gymnasium #178. When we were 9, our family moved to Geneva, Switzerland. We have been living here for 3 years, but our souls are in Ukraine. Our best childhood memories, our friends, our fi rst school teacher, our Crimea, where we went to summer camps, our Donbas, where our grandparents are buried, all remained in Ukraine. We really love and miss our homeland. No other landscape can substitute our dear Ukraine. We feel bad for what’s happening in Ukraine and are doing our best to support and help our country. 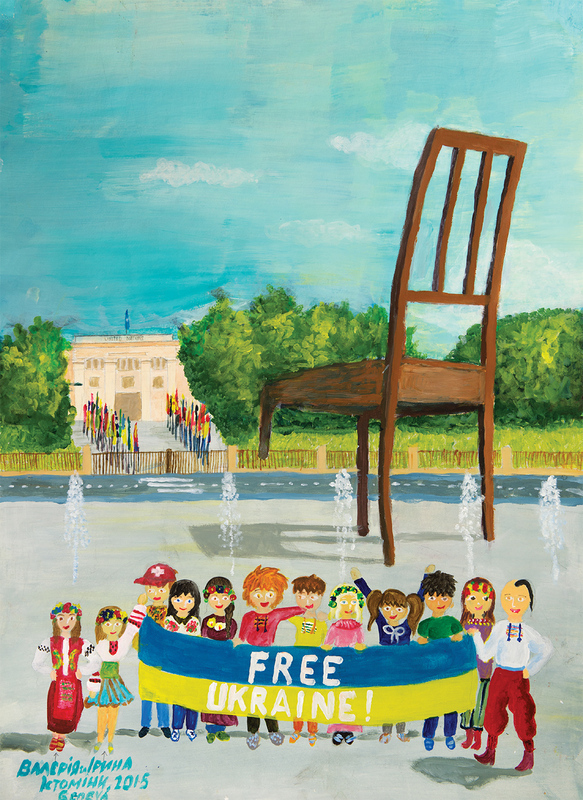 There is an NGO “Free Ukraine” which includes 400 Ukrainians in Geneva. Together with them we participated in different demonstrations near the UN (as we drew on the painting). When Geneva hosts political summits, we gather for protests. We also participate in various workshops and charity funds. Additionally, we are trying to introduce Ukrainian culture to the Swiss. When we visit Ukraine, we take a lot of Ukrainian souvenirs with us and give them to our friends and teachers. They love our presents and many of them want to visit Ukraine to get to know it better. We hope Ukraine will have a bright future and we have no doubt that Ukraine is a European country as we share the same values and priorities.